From the guys who created the Han Solo Carbonite Desk, here comes the Galactic Emperor Throne. It's a limited edition of five units, which means it's almost expensive as the Carbonite Desk itself. The chair will set you back a whopping $5,000, but that's the price you pay to rule the Galaxy and say classic, unforgettable phrases like "Now witness the power of this fully armed and operational PowerPoint presentation! ", "Everything is proceeding as I have foreseen," or "Anakin, could you bring my slippers and today's paper, please?" Carbonite Desk leads to a Galactic Throne Tom Spina Designs follows up their incredibly popular "Carbonite Desk" with the "Galactic Throne", a unique themed chair, originally privately commissioned and now available as an extremely limited edition piece of furniture art. In early 2008, the company's one-of-a-kind "Carbonite Desk" achieved cult status through media coverage on television, in magazines and internet blogs, generating millions of views on the Tom Spina Designs website. After a desk like that, no ordinary task chair would do! Based on the client's requests and interests, artists Tom Spina and Richard Riley drew inspiration from elements of Captain Kirk's bridge chair from Star Trek and the Emperor's throne from the Star Wars films and created a sleek new design. The result is an impressive functional art piece that is well over four feet tall and crafted in custom welded steel. It features an adjustable pedestal and is made to appear to "float" on 8 hidden wheels. The custom upholstery is real leather and the finish is powder-coated gloss black for a classy and durable surface. Tom Spina Designs is a NY-based company which accepts commissions to create highly unique sculpture, furniture and artistic elements for home theaters, offices, trade shows and more. They also create custom displays and meticulously restore one-of-a-kind and often fragile original movie props. Their past clients include businesses, themed attractions and a wide range of private collectors. 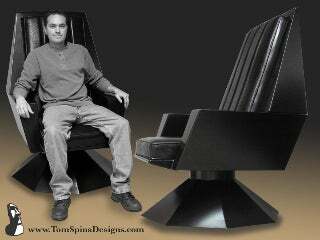 Those interested in seeing photos and learning more about the artists and their latest projects can visit the company site, www.TomSpinaDesigns.com The Galactic Throne is now available in a limited edition of 5 furniture art pieces and potential clients can expect to pay approximately $5000 to commission one. Each will be made to order and can be personalized to the client's preference of color, upholstery and add-on options.